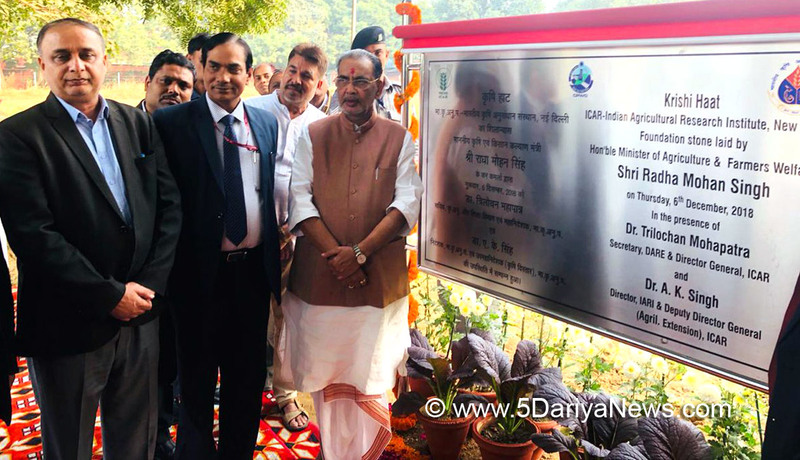 Union Agriculture & Farmers Welfare Minister Radha Mohan Singh Minister laid the foundation stone of Pusa Kisan Haat in ICAR’s Agricultural Technology Information Centre (ATIC) in New Delhi, today. He said that Pusa Kisan Haat will be built across 2.5 acres in which 60 stalls measuring 3m x 3m will be erected in which farmers can sell their agricultural produce and value-added products. At the same time, the technology and value-added products developed by the institutions of the ICAR will be available here for the farmers and visitors. Pusa Kisan Haat will also have 'Technology Park' in which farmers can see Live crop technologies of Pusa. Facilities like food plaza, open-air theater with a seating capacity of 100 people, conference hall, museum, Lab and lecture hall. It will also have facility for agricultural consultation services, seeds and literature for farmers.Union Minister for Agriculture & Farmers Welfare Minister Shri Radha Mohan Singh has said that with a view to encourage and attract youth towards agricultural education and cater to the rising number of students, an international hostel is being constructed. On the occasion of foundation laying ceremony of an international hostel in Pusa, he said that the hostel will be spread across 2 hectares with a built up area of 14,480 sqm. It will have 50 apartments with two bedrooms & kitchen, 50 single rooms with bath amenities and 400 single rooms. A food court catering to 600 students will also be constructed in this hostel along with a gym, games and activity room, sitting lodge; covered parking whose terrace will be useful for organizing cultural events.